Mobile Solar Robots minding the trackers. Dual-axis tracking and performance at the price of single-axis tracking. I first ran into QBotix, Inc. at the SunShot Grand Challenge Summit and Technology Forum because of an informed suggestion, without the slightest hint, to check out their innovative tracking technology. 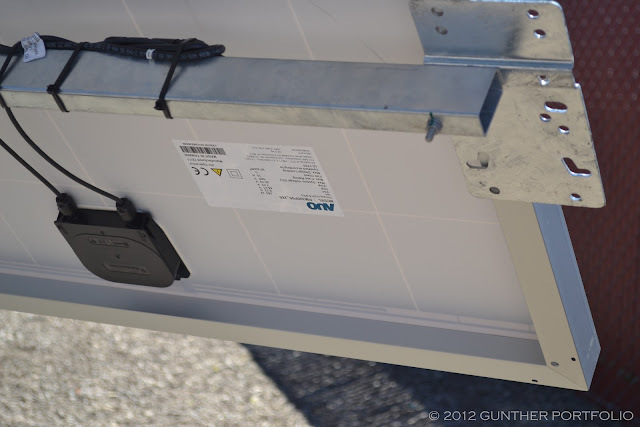 On a foyer table, QBotix displayed a demo tracker with two photovoltaic (PV) modules installed. However, the bottom pedestal of the tracker unit was covered with a cloth although a squarish tube protruded on both sides perpendicular to the tracker pole. I recall seeing cutouts in the tube with clear glass or plastic inserts. I had heard about a tracker concept that did not use motors a year ago from an informed source. Imagining a magnetic levitation approach without mechanical friction, I asked a QBotix representative if the tracker had a motor? As I recall, after some thought, they were not sure how to respond and handed me the business card of Michael Kanellos at Eastwick and directed me to contact him. Flash forward to the QBotix corporate and product launch with “QBotix Unveils QTS: A Revolutionary System for Reducing the Cost of Solar Power with Mobile Robots”. While a number of solar PV trends are driving in the direction of decentralization such as distributed generation and power electronics, for example, QBotix tracking insights have led to the centralization of utility scale tracker array motors into mobile solar robots. Using conventional wisdom, trackers have increased the tracked area of modules to amortize the fixed costs of motors, controllers, steel, foundations, and installation in order to lower the LCOE (Levelized Cost of Energy). However, the tracked area (220 square meter, ~2370 square feet) has approached the size of a tennis court requiring additional steel and complex installation with large cranes, all to hoist a huge sail increasing wind loads and decreasing reliability. QBotix CEO Wasiq Bokhari explained how the company took a new approach envisioning the ideal tracker as being small with a 10 square meter (~107 square feet) tracked area and without motors. The small format optimizes steel utilization and enables pre-assembly for easier installation. A motor less tracker, if possible, would remove a key expense driver and failure point. QBotix also recognized the sun only moves about 10 degrees across the sky every 40 minutes and, given the acceptance angle of PV technologies, it was possible to adjust each tracker once over this interval to track the sun and maximize yields. 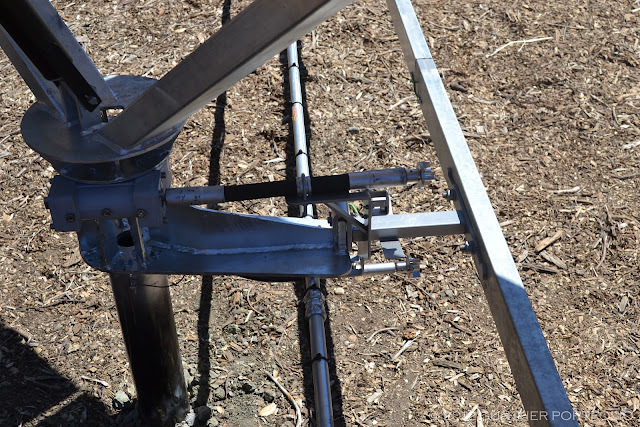 Through the analog to digital conversion of the tracking problem, QBotix settled on the notion of having a robot carry a pair of motors from one mechanically dumb tracking pole to the next. In the first commercial product, the QBotix Tracking System (QTS) uses a Solbot (solar robot) riding a steel monorail between trackers to control 200 mechanical PV trackers each with 1.5 kW (kiloWatt) or up to 10 square meters of PV modules for a total of 300 kW per robot. Each 300 kW ground mounted block is deployed with two (2) Solbots and charging stations, one operating and one backup, to maximize uptime. QBotix has settled on each standard 1 MegaWatt QTS block using eight (8) Solbots for optimal operation, scaling in linear fashion to 8000 Solbots for a 1 GigaWatt utility scale PV plant. QBotix claims QTS reduces the cost of dual-axis tracking by a factor of two, decreases the number of motors by a factor of one-hundred (100), and can withstand high wind loads. Similar to existing dual-axis tracking solutions, QTS dual-axis tracking increases energy yield by 8-15% over single-axis trackers and 30-40% over fixed tilt PV systems lowering the LCOE by up to 20%. Though hot swappable and easily replaced, the solar robots are ruggedized for reliable 20 year operation with an IP65 rated enclosure, -30 to +50 degrees Celsius (°C) operating temperature, and backed by a 10 year base warranty. Each autonomous solar robot is packed with embedded processors, sensors, GPS (Global Positioning System), and independent communications to monitor PV plant performance, predict failures, and schedule maintenance. The Solbots are battery powered and cost about $0.30 to charge per day. 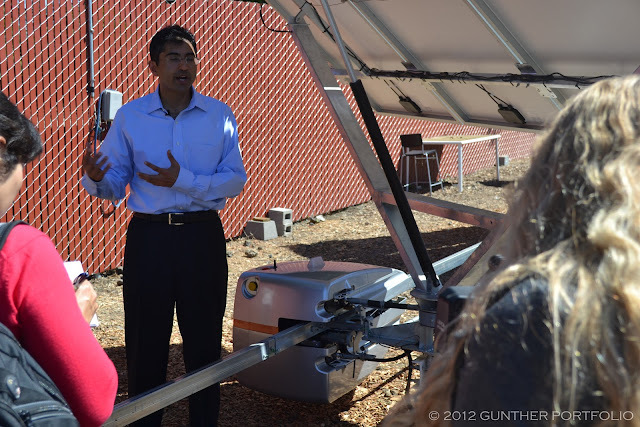 Typically, one Solbot operates the PV plant while the other charges. I expect tracker duties are alternated daily to wear level Solbot operations. Before Labor Day, QBotix hosted a media tour at their commercial QTS Test Field not far from their corporate headquarters in Menlo Park. I still find it strange to be on the inside of the fence at PV installations! Completed just two weeks before our visit, the near 24 kW solar plant includes twenty trackers each with four (4) 72 cell multicrystalline PV modules in the 285 to 295 Watt-peak (Wp) range sourced from three manufacturers: AU Optronics Corp. (NYSE:AUO) aka BenQ Solar, Motech Industries Inc. (TWO:6244), and Yingli Green Energy Hold. Co. Ltd. (NYSE:YGE). QBotix emphasized the QTS is compatible with the gamut of framed PV modules and will support frameless glass-glass modules as well due to high customer demand. The inset photos were all taken at the test field. I made a quick point and shoot video of a Solbot in action leveraging the professional video preparation work of CNET News correspondent Kara Tsuboi and team for “Mobile ‘bots work to increase solar panel efficiency (video)”. The videos provide the complete picture of how the Solbot engages mechanically with the trackers at two interfaces, adjusts the azimuth and elevation of the tracker, and then moves along to the next one. 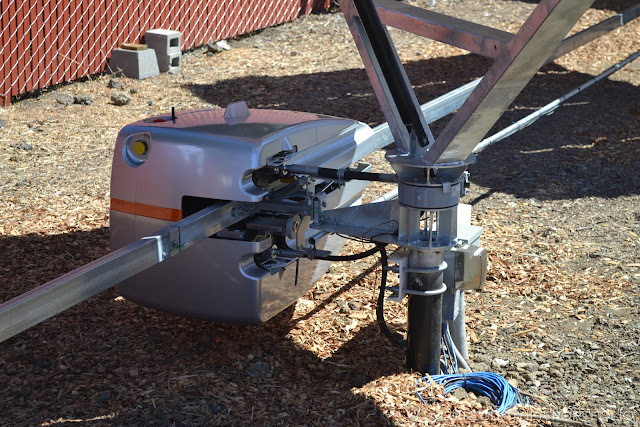 Although the DC power cables are strung alongside the monorail at the QTS Test Field, QBotix said an enclosed tray for the cables was being added to the bottom side of the monorail to further streamline QTS installations. Offline now, an earlier QBotix’s test system was installed a year ago using a prototype design. The prototype used an enclosed track to guide the robots between the trackers and explains what I saw at the SunShot Forum. A QTS installation requires about 6 to 8 acres (2.4 to 3.2 hectares) of land area per MegaWatt (MW) depending on the configuration. By comparison, current dual-axis PV installations require around 7 to 8 acres per MW and single-axis about 5 to 6 acres per MW. However, QTS can be installed on uneven or sloping land and does not require extensive land grading preparation or trenches for underground cabling. Closer tracker spacing is possible with QTS but the tradeoff is increased losses from tracker to tracker shading early and late in the day. Among the few downsides to the QTS are the low to ground monorails hindering animal migratory paths and limited dual land use because of the Solbots dashing about potentially scaring native wildlife or domestic farm animals. Addressing the question of bankability, QBotix CEO Bokhari said only 3 to 6 months of field operating data were required for tracking technologies as opposed to more costly PV modules. Of course, the QTS includes backup Solbots and any failures can easily be replaced lowering risk. The steel used in the trackers and monorail are known quantities, and if the QTS Solbots were to fail completely, the trackers would still aim the flat plate PV modules at the sun much like a fixed tilt rack and continue to generate electricity albeit at a lower levels. Via centralization, QBotix can use the most expensive and reliable motors and components in the Solbots and amortize just a few cents per Watt across a system. QBotix must address multiple segments of the PV value chain to adopt the QBotix Tracking System including primary EPC (Engineering Procurement and Construction) company customers with the consent of long-term owners and investors following initiation by visionary project developers. QBotix said the first commercial QTS installation would be marked by a joint customer announcement at the end of September 2012 and will be located in the San Francisco Bay Area. Having qualified QTS for deployment after a yearlong qualification, Siemens Technology-To-Business Center is one potential customer. 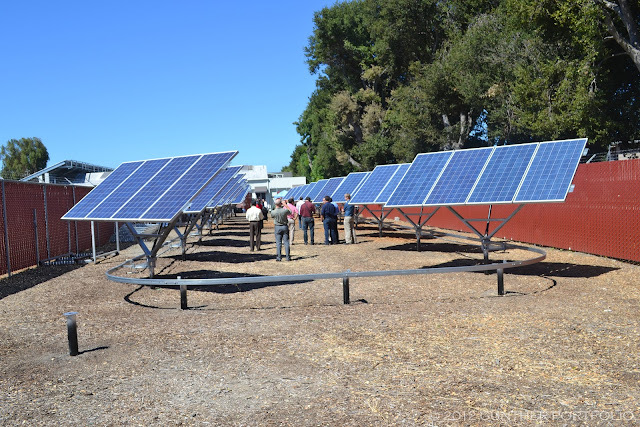 When this proposed Solar Power Tracker Demonstration System is operational, the County will receive 550,000 kilowatt-hours (kWh) of renewable energy generated by the system at no-cost to the County during the six-year demonstration term. 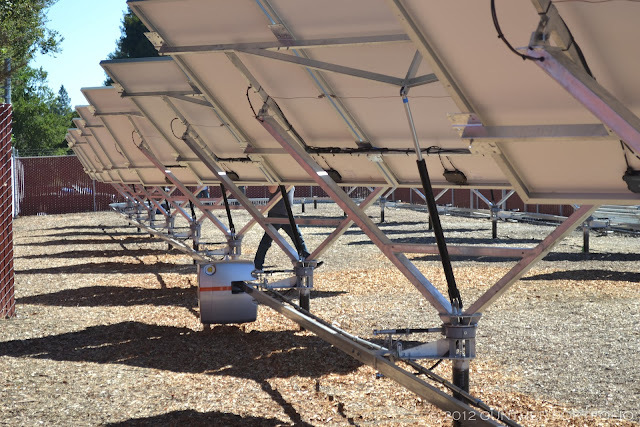 The design and construction of the Solar Power Tracker Demonstration System is expected to take five months to complete, and construction is expected to start in September 2012. In developing a core robotic platform, QBotix has plenty of work left to complete in the solar market. The QBotix Tracking System has applications in CPV (Concentrating PhotoVoltaic) and CSP (Concentrating Solar Power) and has been proven with CPV modules with 0.5 degree tracking accuracy. High Concentration PV (HCPV) requires tracking accuracy of only 1 degree or better depending on the technology specific acceptance angle. According to QBotix, more accurate mechanical tracker gearing is used for HCPV than PV and a closed loop system is employed with HCPV to increase tracking accuracy versus the open loop system adequate for PV. Since higher accuracy requires more tracker adjustments per unit time, Solbots will serve fewer trackers in HCPV applications, or, in other words, more Solbots will be required per 1 MW of HCPV than PV. Some of the earliest QBotix patent applications also relate to heliostat tracking and control. Heliostats used in power tower CSP applications require the highest tracking accuracy of 0.2 degrees or better and will be the most challenging for QBotix to cost reduce and commercialize. QBotix was founded over 2 years ago in August 2010 and raised 6.5 million Series A funding in March 2012 from New Enterprise Associates, Firelake Capital, Siemens Venture Capital, and DFJ JAIC for a total of 7.5 million including seed capital. QBotix now has 25 full time employees and was first known as Black Swan Solar if you’re interested in reviewing what was written about them earlier. As a US based innovator, QBotix is proud to source and build the solar robots on site using off the shelf components and machining others with a Haas Machining Center. Manufacturing can be scaled further leveraging contract manufacturers based on demand. “CPV Trackers: A Crucial Aspect of Project Success?” by Tildy Bayar, Associate Editor, Renewable Energy World, is a well written post on dual-axis trackers rendered obsolete by the QBotix announcement the next day. There’s a word for that: Innovation!